Transform The Energy Everywhere You Go! In the year ahead, the focus isn’t on simply detoxing or eliminating or letting go of what’s not working… and, it also isn’t just on manifesting, creating and making…. It’s about being the kind of influencer that matters most: acting as a catalyst to change the world around you! While we can’t change/control/dictate the actions of other people, nor would we want to, we can become the most positive of influences that lifts life higher everywhere we go. It’s time to be even more of the magic wand that you are! How do we become greater positive influencers of others? As with all things, I’ve got no definitive answer. But, I know for me it starts with my energy. When I’m highest and lightest, I feel unstoppable in how far I can turn up the dial of the energy around me— no sage wands or resins required! That said, all the sage wands, the energy clearing tools, crystals and rituals have their place in facilitating daily magic-making. A lot of the time, it’s easier to eat with utensils, it’s easier to paint with some sort of brush or knife, it’s easier to get a nail in a wall with a hammer. It’s not the only way to do any of the above, but it makes it all easier. So, you can grab yourself a smudge stick or a vacuum and get the good vibes flowing even brighter around you at any time! That said, you can’t exactly walk into a restaurant or your office with a Tibetan singing bowl and a pile of sage to burn. So, knowing that you, yourself, can clear space with your high, light and happy presence, all alone, on its own, is epic. Keeping yourself in that high place is everything. Amping up my own energy is taking me down a few new roads lately. I’ve been following the signs I see, and letting that energy move me. 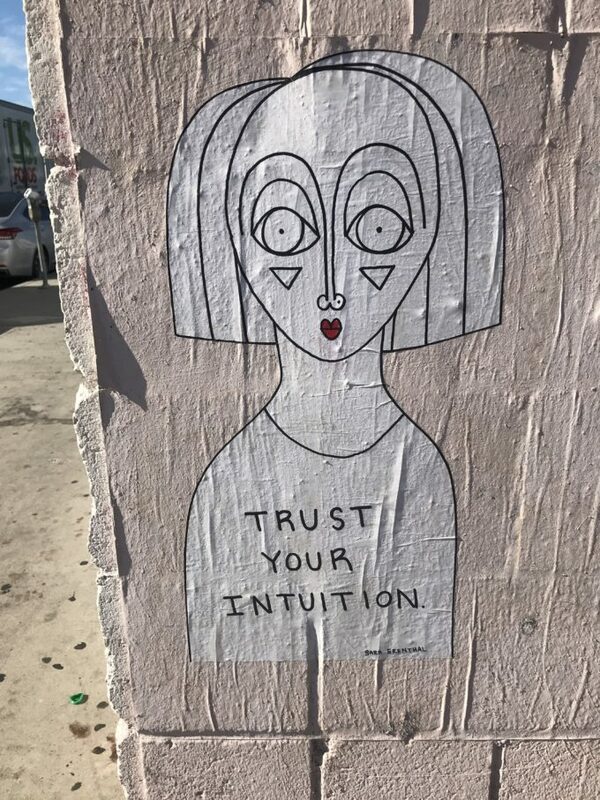 I’ve even been getting messages from the street art flashing at me on the walls in Los Angeles as I walk by them! I finished the Medical Medium’s Liver Cleanse a few months ago and really loved it personally. It may or may not resonate with you to do any type of cleanse, but it really hit home for me after a year of tons of action and energy starting to droop. Afterward I felt really woken-up, fresher and more CAUSE rather than EFFECT over my body than I have in a long long time. So, now I have a shopping cart online full of barley grass juice powder, adaptogenic chaga mushrooms and a few brilliant immune boosters that are a part of my next phase in energy. And, while the supplements are great, the real stuff is mountains of veggies to juice and fruits to gather every week at the Farmer’s Markets, including piles of cilantro for salads and smoothies, tons of celery and all the squash of the season to indulge, fully! After I finish typing this, I’ll be getting a new tray of micro greens ready to grow (*a micro-green growing kit was the best wellness gift I’ve ever received!) and I’m super-excited for all of this! Is there something you’ve been craving? That’s usually the first great place to look when you’re wanting to make a shift to a higher level. If you’re craving it, there’s something to look at and possibly start indulging right now! As I was making a cauliflower fried rice that looked pretty good, I had a flash of some fresh green onions that were in the produce bin. Everything was done- cooked, seasoned, ready to serve, and for some reason I had to chop up a bunch of green onions and give it a stir before serving. Those fresh green onions turned something good to great– a layered taste explosion versus a good but not memorable side dish. Those flashes of insight come to us in all different ways— street signs, art, songs that seem to follow up around on the radio, social media posts, coincidences, dreams— you name it. Intuition can just slip through in all kinds of moments. Follow those flashes and you’ll be led to new paths, insights and ideas. If you’ve been ignoring some intuitive hits and signs and flashes, can you start following them now?! Stay spacious so that you can actually follow your intuitive brilliance. Of course, clear your clutter. All of it. And get in the practice of staying clear of clutter once you get there! Take your time and build solid habits to clear it all. But also, on top of the actual physical clutter, start to clear the kinds of clutter of ideas and energetic chaos that leads us to self-criticism, self-doubt, negative assessments of our lives and our worth, and most tricky of all, damning self-comparisons. All those energy blocks have no space in your life as a catalyst! All of that self-generated negativity does not belong in your days as a positive influencer of the world! We all have these moments, but let them be moments, not the chorus of a song we sing to ourselves far too often. As you start fining more space within yourself, more space in your life, more awareness of all that is your bliss and more of that bliss that brings you energy, your frequency increases and your whole life reflects that shift. You’ll see more people smiling back at you. You’ll hear more pleasant news. Your cup will be more full and you’ll have more energy to share. You ‘ll find more solutions. You’ll think about the greater good. 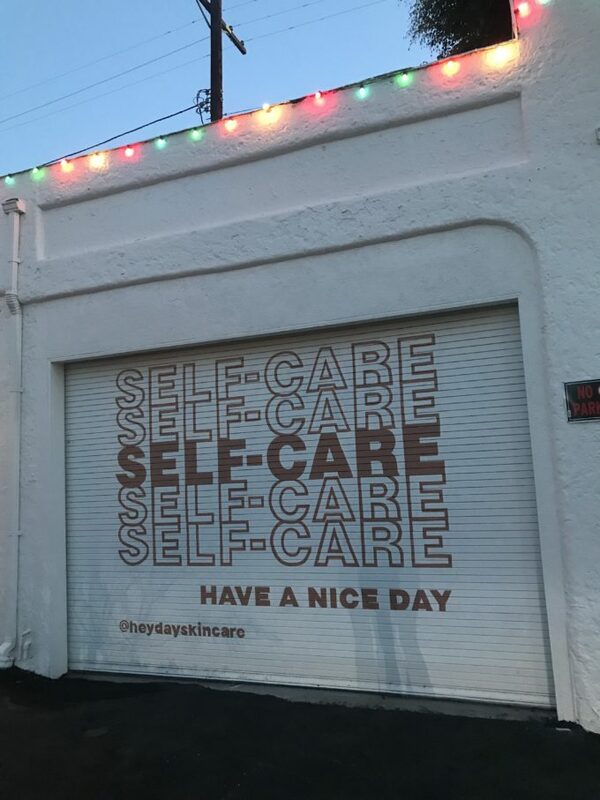 Staying in the flow of self-care, following your intuition and creating more clear space in life are my most cherished practices to expand and expand. Even a tiny bit of a positive influence outside of me makes the day infinitely more rewarding. Together, can you imagine how much we can do for the planet, the animals and people in need?! Fill yourself up and radiate that joy everywhere you go. 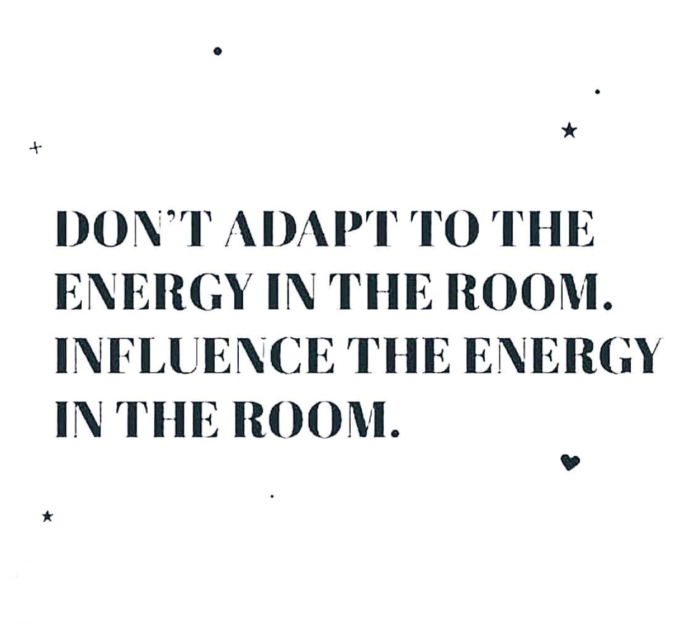 You may not be able to change everyone and everything, but that bright energy is a huge part of the solution in and of itself!!! Thank you for sharing this! I’m looking for a body reboot and this looks perfect! Previous post: Feng Shui For The Awesome Year Of Jupiter In Sagittarius! Next post: How To Make Your New Year Resolutions A Part Of Your Lifestyle Every Day!